Ocular Myasthenia Gravis (MG) affects eye muscles, resulting in the patients struggling to control and raise their eyelids (drooping eyelids) which can impact their line of sight and general vision. The Ptosis Crutch, developed by the Biomedical Engineering group is an adjustable crutch that can be fitted to spectacles to support one or both eyelids. It has been place in the Public Domain and 3-D printer files are available. UCT inventor and surgeon, Dr John Lazarus (Division of Urology) and co-inventor John Williams (an independent engineer) invented a novel surgical tool, the Locator, for use in large kidney stone surgery, where it improves the efficiency of the minimally invasive procedure. The Locator assists a surgeon in achieving a precise percutaneous needle puncture by stabilising the needle, making it easier and quicker. The reduction in procedure time has the additional benefit that less X-ray radiation exposure is required, which is safer for the patient. The long radiolucent arm also reduces X-ray exposure to the surgeon’s hands. UCT’s Professor Andrew Bosch developed PeptoSport® during research, that he conducted in the Medical Research Council / UCT Research Unit for Exercise Science and Sports Medicine (ESSM), on the role of carbohydrates and proteins in sports performance. The unique formulation contains key protein hydrolysates (PeptoPro®) which, unlike intact proteins normally found in food, require no digestion and so are absorbed directly into the blood. The product has demonstrated a reduction in post-training muscle soreness in the calf and quadriceps muscles during periods of high training load and is intended to enhance recovery of sportsmen and women. Dr Alan Horn from the Department of Paediatric and Child Health invented a simple, but novel cooling system called “Neofan” for the prevention of neurological damage in new born infants who had been starved of oxygen during problematic labour - a condition termed hypoxic-ischemic encephalopathy (HIE). By cooling the baby’s brain immediately after birth this damage can be prevented or minimised. Neofan includes a control system that regulates the temperature and maintains it within the required range, i.e. below normal body temperature, and it can be integrated into a standard incubator crib’s temperature control system to work alongside the normal heating function. Unlike conventional magnetometers, which are based on quartz sample holders,and only capable of varying the operating temperature, the UCT Magnetometer can characterise ferro- and super-paramagnetic materials at actual industrial operating conditions (e.g. temperatures between 25 and 500°C and pressures of up to 50 bar). 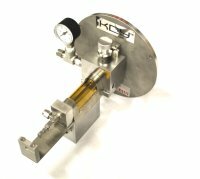 Using magnetisation, the magnetometer provides information on the degree of reduction, sintering and crystal size distribution in super-paramagnetic samples. UCT’s Centre for Catalysis Research Professors Michael Claeys and Eric van Steen, and Sasol Technology's Jan van de Loosdrecht and Kobus Visagie invented an In-situ Magnetometer that arose from their long-standing joint research efforts. Although originally designed for the study of catalysts, the In-situ Magnetometer is in fact a generic research tool for the characterisation of nanoparticles in a diverse range of fields such as: Fischer-Tropsch catalysis, novel magnetic materials for water treatment, metal extraction, nano magnet and recording devices. The In-Situ XRD cell was invented by Prof Michael Claeys (Department of Chemical Engineering) and his now graduate student Dr Nico Fischer. The cell is a cutting-edge research tool and can be retrofitted to existing X-ray diffractometers or synchrotrons to enable materials such as catalysts to be studied at elevated temperatures and pressures, in changeable gaseous or liquid environments. phase power. The technology was developed using the Department of Science & Technology's Innovation Fund. UCT licenses this IP exclusively to the spin-out company "Hot Platinum" who manufacture the units. 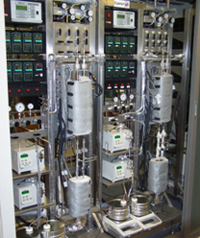 Catalyst Test Units have been manufactured in the Centre for Catalysis Research in the Department of Chemical Engineering for a number of years. 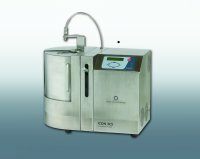 The streamlined, professional-looking units are mobile, skid mounted and modular and are a far cry from the ‘rigs’ that one would typically find in a research student’s laboratory, which are generally a “Heath Robinson” amalgam of piping and wiring! What started as an internal requirement has spread to the production of test units for industry as well as other universities in South Africa. Their modular construction has allowed a level of standardisation and also the rapid interchange of malfunctioning components, with off-the-shelf spares, minimsing research downtime. Of note are the enquiries that are being received from Europe and the UK.